Can I Date Men My Daughter’s Age? Hi, I’m an avid reader of your blog and hope that your readers can help me put things into perspective. My name is Elizabeth and I’m in my late forties to early fifties (I don’t want to give too much away). Here’s my dilemma, I have a daughter who I absolutely adore and love with my whole heart but she has distanced herself from me, in fact she has lost all respect for me simply because I desire and date younger men. I understand that it can be awkward for her to have a mother who dates men her age but I can’t control what my heart and body wants, abi? What should I do? Give up what makes me happy in order to get close to my daughter again, or live my life how I want? After all I only have one life to live, abi? Elizabeth is played by Ireti Doyle in the EbonyLife Film production of FIFTY, executively produced by Mo Abudu. Will you sympathize with Elizabeth or blame her for her situation? Watch the MUST-SEE film this December to live the situation with her. MO ABUDU, WALE OJO AND IRETI DOYLE FOR FIFTY THE MOVIE. 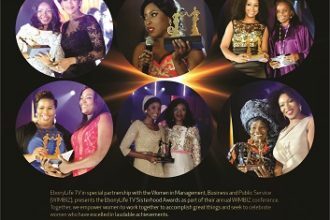 ‘FIFTY’ stars four of Nigeria’s power actresses including Ireti Doyle, Dakore Egbuson-Akande, Omoni Oboli and Nse Ikpe-Etim. What is the premise behind the film? 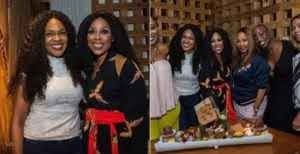 Well, in the words of the executive producer herself, Mo Abudu it is to “showcase African women coming of age, loaded with increasingly similar aspirations and dilemmas faced by their contemporaries everywhere, while yet navigating unresolved traditions and obligations”. The Grand Premiere of FIFTY comes up on Sunday 13th December 2015 at Eko Hotel and Suites and will be in cinemas nationwide on December 18th December 2015. Tickets for the Grand Premiere are limited, so book your ticket(s) now!